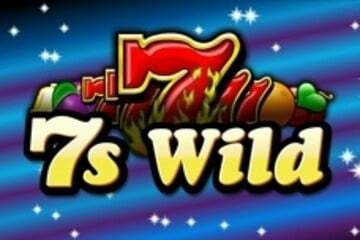 At first, 7s Wild looks like a very old-fashioned 'fruit machine' game, but when you get into it you will see that there are lots of modern features in the 7s Wild game. One of those features, is a free spins bonus round, which gives you extra chances to make a big win, which is similar to games like Blazing Sevens. While it's true fans of video slots have a far bigger pool to choose from, nostalgics who prefer playing old school classics are not left hanging. More than a few developers have made sure to also provide traditional fruities featuring fewer reels and paylines combined with simple gameplay which doesn't require a university diploma in order to be understood. Even though IGT's 7s Wild uses 5 reels, it plays with familiar symbols and a soundtrack which takes you decades back. Visually as simple as can be, the game uses starry background and brightly coloured 2-dimensional symbols landing on a 5x3 grid. Cherries will pay but not much; the most they're willing to cash out is 100 credits for five-of-a-kind. Payouts increase if you land 3 or more oranges, plums or bells, but the biggest reward of 1,000 coins is offered for matching 7s on one of 5 paylines. They do have to occupy adjacent reels, though it makes no difference which end the combo starts from. That's right, this is a both-ways-pay classic slot! Ready for more surprises? Five 7s will not only deliver the biggest prize, they'll also launch 5 Free Spins while claiming the role of a Wild icon which subs for all others. If there is a player out there who doesn't like an opportunity to win real cash without having to risk any of their own, we have yet to meet them. The game’s theoretical payout ranges from 92.03% to 96.08%. Since paylines are flexible, one can choose to play with 5, 4, 3, 2, or a single one. Bet range varies accordingly between 25 coins with lowest stake per line and only 1 line active, and 150 coins with maximum line bet and all paylines in play. Is this the best classic title we've ever seen? Not quite, but that's not to say it doesn't have its advantages. It looks and sounds old school, and the same time increases your winning chances by paying both ways and offering free games with a helpful substitute. It's actually a nice way to boost a classic without overcomplicating it more than traditionalists among us would appreciate. Those looking for additional enhancements are welcome to further explore IGT's range and play the likes of Triple Red Hot 777. This retro-looking game with 5 reels and 5 paylines features a x3 Wild multiplier, free games with Spitfire Multipliers boosting payouts by x7, and a jackpot worth 20,000 coins. One of the most interesting things about the 7s Wild slots game, is the fact they use some of the familiar sounds and graphics from famous IGT games. For a start, you will notice a background sound when the reels spin that is very similar (but not identical to) games like Double Diamond and 5-Times pay. It's kind of like a white noise, almost random sounds, that you will be familiar with if you enjoy those older style classic slots and 3-reel games. Also, the 7s Wild game has the celebration fireworks that you will know and love if you are a fan of the classic Wolf Run slots game. At the same time, it also has the same music that you get in Wolf Run when you hit the big win. Although I haven't yet seen this game in Vegas casinos yet, I am sure it will be there somewhere. It will be interesting to see if the real money casino game is the same as the online version, or there are additional features and bonuses.